We review recent advances in laser cell surgery, and investigate the working mechanisms of femtosecond laser nanoprocessing in biomaterials with oscillator pulses of 80-MHz repetition rate and with amplified pulses of 1-kHz repetition rate. Plasma formation in water, the evolution of the temperature distribution, thermoelastic stress generation, and stress-induced bubble formation are numerically simulated for NA=1.3, and the outcome is compared to experimental results. 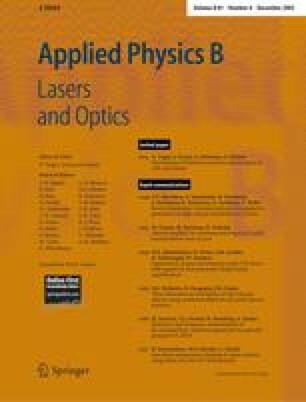 Mechanisms and the spatial resolution of femtosecond laser surgery are then compared to the features of continuous-wave (cw) microbeams. We find that free electrons are produced in a fairly large irradiance range below the optical breakdown threshold, with a deterministic relationship between free-electron density and irradiance. This provides a large ‘tuning range’ for the creation of spatially extremely confined chemical, thermal, and mechanical effects via free-electron generation. Dissection at 80-MHz repetition rate is performed in the low-density plasma regime at pulse energies well below the optical breakdown threshold and only slightly higher than used for nonlinear imaging. It is mediated by free-electron-induced chemical decomposition (bond breaking) in conjunction with multiphoton-induced chemistry, and hardly related to heating or thermoelastic stresses. When the energy is raised, accumulative heating occurs and long-lasting bubbles are produced by tissue dissociation into volatile fragments, which is usually unwanted. By contrast, dissection at 1-kHz repetition rate is performed using more than 10-fold larger pulse energies and relies on thermoelastically induced formation of minute transient cavities with lifetimes <100 ns. Both modes of femtosecond laser nanoprocessing can achieve a 2–3 fold better precision than cell surgery using cw irradiation, and enable manipulation at arbitrary locations.